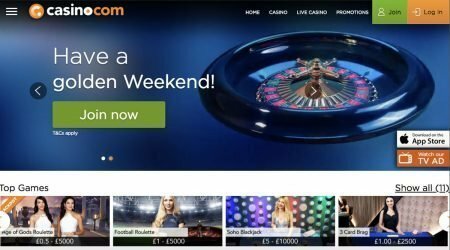 First launched as Slots Heaven in the early 2000s, Casino.com was rebranded as an online venue in 2007 and underwent another reboot in 2016 to bring their offerings up to a higher standard. With plenty of financial clout, the parent company, Mansion, has previously sponsored Premier League teams and co-produced the MansionPoker.com Dome Challenge, which went on to win an Emmy Award. The platform’s key software provider is Playtech, which is well-regarded in the industry and has delivered a world-class experience for Casino.com players. The games available are supported on desktop, and most are also available on mobile. The interface is fast and searching for a title is quick as the products are broken down by category. Once a player has clicked through to a particular category, they can then search through well-organised subsections. The slots area is certainly the busiest with a varied line-up, but there are also plenty of table and card game variants. Every Friday in the month is a bonus day at Casino.com, as one slot is picked to be a featured game. Account holders just need to enter the weekly code word, which is revealed on the site, to get a £5 bonus to use on the chosen game. The welcome package at Casino.com is made up of a cash bonus and free spins. The 20 free spins are available to use as soon as a player has registered – they do not need to make a deposit. Once the deposit is made, it is increased by 100% to a maximum of £100, and 180 more free spins are made available. The spins are released in packages of 20 for eight days after the first deposit – they can only be used on Age of the Gods. The minimum deposit is £10. All bonuses, including the welcome bonus, come with wagering requirements that must be met before an account holder can withdraw any money. When a bonus is accepted, it comes with 40 times the bonus wagering requirement. All games on the site count toward this amount, but they don’t all count in full. Those that do are slots and scratchcards, but players can check with the terms and conditions of each game to see what percentage of a wager will count. Promotions and free spins are important for retaining a loyal clientele, and this is why casinos are so keen to provide them. 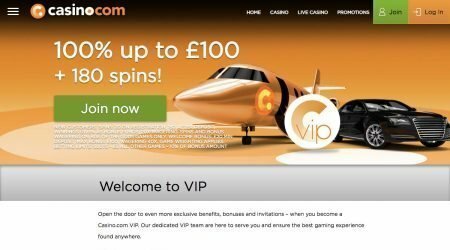 At Casino.com, there is a regular suite of offers that reflect events in sport or the seasons, but some are a constant fixture on the site. Side Bet Insurance can be used to make the experience of playing Live Blackjack even more exhilarating. It provides 20% cash back up to a value of £100 on all side bets placed on the game, all weekend. To access this promotion, players must opt in each week. It takes place from 12.01am on a Friday to 11.59pm on a Sunday. For football fans who are good at picking a winning team, the Premier League Spins promotion could be highly profitable. All they need to do is pick a Premier League team, and each goal they score equals 20 free spins. Players have to pick a team each season. The Pick and Mix competition has a cash prize of £250,000 each month. To be in with a chance of winning, players have to opt in and then stake £10 on one of the selected games. This will earn them one ticket for the prize draw. The more tickets they acquire, the better their chances of winning. Four times per month, a game of the week is delegated – this provides the chance to earn double tickets. With the right software, online casinos can provide a stellar assortment of games, and Casino.com has curated a collection of more than 300 titles. Bettors can choose to access games straight from their browser using Instant Play, or they can download the casino’s own software to their desktop. The virtual slots have plenty to keep seasoned and novice bettors amused for hours, with good-quality video slots, multi-reels, classic reels and multi-paylines. The rules are easy to pick up in a few minutes, and in the progressive jackpots area, huge amounts of money can be won. Bettors who want to challenge themselves with expanding wilds, scatter symbols and multipliers won’t be disappointed. There are plenty of themes to choose from, including the increasingly popular Marvel Slots, in which players can enjoy their favourite characters from the comic book universe. The Hulk, Ironman and Captain America are all present and ready for action. Bettors who visit casinos to try out blackjack have more than 14 variations, with 21 Duel Blackjack, Surrender, Switch and Pontoon all making an appearance. Games can be played either in practice mode or with real money, which gives bettors the chance to learn more about the platform mechanics as well as the game itself. Casino.com has a wide selection of roulette options for all levels of player, so beginners can work their way up to the more complex versions. This area includes 3D, Marvel and Multi Wheel roulette, each with stunning graphics and old favourites such as French, European and American. Poker is another popular choice with bettors, and card players can test their luck at Texas Hold’em, Pai Gow, Caribbean Stud and Red Dog. There are also dice games to provide a degree of variation – these include Sic Bo and basic craps, along with a raft of other familiar titles. Video Poker is a blend of poker and virtual slots and has variants to meet the skill level of any player. This classic game can be played as 2 Ways Royal, Joker Poker, Deuces Wild, and Jacks or Better. Some are fast and some are slower-paced to suit the bettor’s preference. If the traditional slot, card and dice games aren’t to a player’s liking, then they can head over to the Scratchcard and Arcade section of Casino.com. There is a substantial range that is regularly added to – fans can indulge their passion for Keno, Rock Paper Scissors, Darts, and Bingo variants, including Pop Bingo. The Scratchcard section is particularly well-populated, with more than 40 options, including seasonal themes and film characters. The Live Casino is a major draw, allowing players to experience the thrill of a physical venue without having to leave home. Games are live streamed to a desktop in full HD, providing a crystal-clear view of the action and close-ups of deals and spins. Bettors can explore all the established card or table games, such as blackjack, baccarat and roulette. 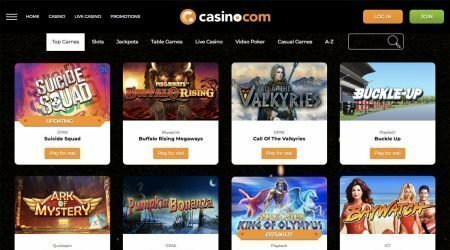 When account holders want to make a deposit with Casino.com, there is a range of payment methods for them to consider. They accept credit and debit cards such as Visa, Mastercard, Maestro and Electron, as well as Skrill and Neteller e-wallets and paysafecard, WebMoney and InstaDebit. Alternatively, members can authorise a bank account and use it to pay in funds. Withdrawals are made to the original deposit method and the minimum that can be paid in is £10. There are two main ways for a customer to get in contact with the casino when they need help with the service or have a query. The fastest and possibly most convenient method is by calling the free phone number within office hours – this is 0800 9012 483. Alternatively, players can click on the Contact Us button to be directed to a form. Once they have filled it in and sent it off, the casino will take a look and get back with a resolution as soon as possible. When the team has lots of tickets, it can take 24 hours for a staff member to reply, but at quieter times, it may only be a couple of hours. With full regulation from the gambling commissions of the UK and Gibraltar, Casino.com can be relied upon to safeguard players’ funds and to deliver a fair gaming experience. The selection of titles is good, with plenty of traditional and more unusual options to explore in the tables, slots and live areas. Within each specialism, care has been taken to cater to both newcomers and experts, with free play options and sizable betting limits. If anything goes wrong, customer support is available not just online but also via a free phone number, which will please many bettors. By using software that is compatible with desktops and mobiles, it is clear that Casino.com is striving to provide an excellent user experience for all customers, no matter how they prefer to play. The promotions are also impressive, with a good selection of regular offers on specific games, alongside a sensible welcome bonus to get new account holders up and running. 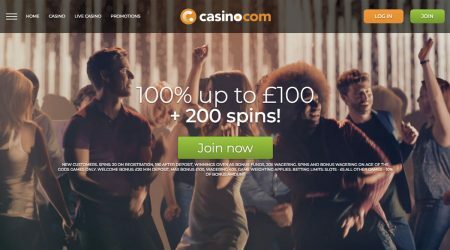 Casino.com is a good all-rounder with solid financial back-up from an established parent company, should it be needed. It is a great starting place for beginners and just as suitable for veteran players who are seeking a fresh casino.